Lithuanian leisure carrier Small Planet Airlines is poised to become the Baltic area’s largest operator in terms of passengers flown, revenue, and fleet size in 2018. The airline’s European-based fleet will expand to 28 aircraft, as passenger numbers are set to increase to some 4 million and revenue is projected to surge by 30% in 2018. Small Planet reported a profit of 5.1 million euros in 2017, recovering from a loss in 2016. Last year, the airline grew its annual revenue to 323.1 million euros, a 45% increase on 2016, as it carried 2.7 million passengers (35% up year-on-year). Its EBITDA topped 9.6 million euros in the 12-month period, a significant improvement on the 0.5 million euros of deficit posted in 2016. Germany is becoming the fastest-growing market for the Lithuanian charter carrier, with plans for 10 aircraft to be based at various German airports. According to the airline’s senior manager, growth in Germany is the key to balancing seasonality, since holidaymakers there are less impacted by adverse winter conditions. Small Planet has already sold all available seats in Germany for the upcoming winter season, he reveals. For years, Poland was the largest market for Small Planet Airlines’ operations, but this year the carrier is not planning any significant growth there. “The situation in Poland is stable and good, and one additional aircraft will join the Polish fleet. In Germany, on the other hand, our growth is likely to exceed 200%, a trend that is influenced by various factors. First, Germany is Europe’s largest aviation market, so the demand is naturally high there. At the same time, the insolvency of Air Berlin opened an additional niche opportunity,” Kaikaris adds. Next month Small Planet Airlines is also planning to launch two new European bases: at Chania on the Greek island of Crete, and at Stockholm’s Arlanda airport. Flights to Albania, Croatia, Greece, and the Canary Islands will be performed in cooperation with major Scandinavian tour operators. Asia, another strategic market for improving aircraft utilization, is on the way to triple growth. Currently, Small Planet operates a fleet of two Airbus aircraft in the region, but that number is expected to grow to six or even eight by the end of 2018. 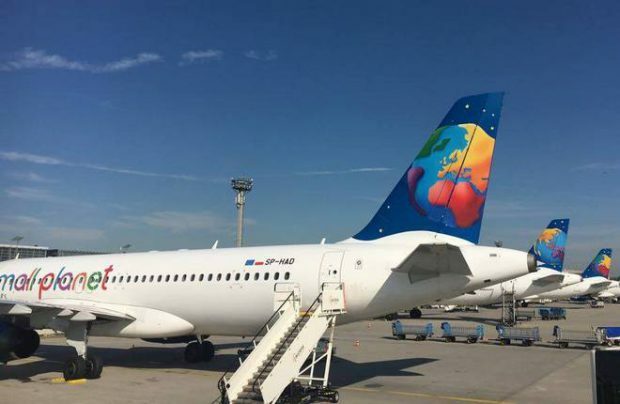 Based in Cambodia, the company focuses on outbound Chinese tourism, currently operating flights between Palau and Hong Kong as well as between Macau and Cambodia, Vietnam and Bali. In total, Small Planet Airlines will fly 240 routes from 15 European bases in the summer of 2018. The airline’s European fleet will grow to 28 aircraft – 20 Airbus A320s and eight larger Airbus A321s.